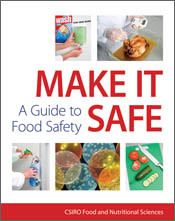 Food safety programs set out how safe food is produced. The primary objective of designing food safety plans is to ensure food is safe and suitable for human consumption. However if the design of the food safety plan is affected by lack of knowledge of the biological, chemical and physical (BCP) hazards of the food production process, then food safety may not be assured. This paper focuses on three problems when analysing the microbiological hazards that can affect the quality of the food safety plan and which may result in unsafe food and a false sense of security for the food manufacturer. The seven principles of Hazard Analysis Critical Control Point (HACCP) (Table 1)1,2, used to design a food safety plan, are well known by the food industry worldwide and an overview of the principles can be taught in one training session. Table 1. The seven principles of HACCP, used to identify, evaluate and control food safety hazards. However, this does not mean that the HACCP team (which may be only one person in a small food company) has the expertise to actually identify all the BCP hazards that could occur or understand whether the hazards pose a significant risk, as is required in Principle 1 (and is necessary for effective design of Principles 2 to 7). What will be the effect on safety if, due to lack of knowledge and education, a hazard is not identified and is therefore left out of the plan, or a potentially serious hazard is classified as not significant? In order to identify potential hazards a process flow diagram (PFD) should be constructed showing each step in the process from raw material purchase and receival to finished product storage and delivery1,2. The first problem can arise when designing the PFD. The PFD can be very complicated as food can be multicomponent. If the HACCP team, overlooks a step when drawing the PFD, such as thawing of frozen ingredients, a cooling step or delay after mixing, the hazards for these steps such as growth of pathogens and the associated time and temperature controls for safety will not even be considered. Once the PFD is accurate and complete, the BCP hazards at each step of the PFD must be identified. Principle 1 states that all the potential hazards that are reasonably likely to occur must be listed1,2. The second problem is therefore when the team does not recognize a potential hazard at a step. When considering the microbiological hazards, the HACCP team’s knowledge of the likely foodborne pathogens will be critical for safety. Table 2 lists the most common microbial pathogens present in food and also lists common chemical and physical hazards3. Table 2. Examples of biological, chemical and physical (BCP) hazards that are commonly considered in a food. However it is important to keep microbial pathogens in perspective. Not all pathogens can be found in all foods. Not all foods can support pathogen growth and survival. Some pathogens will enter the food in the raw material. Other pathogens will enter the food during processing, such as handling and packaging or from the factory environment. Figure 1 shows an example of this by illustrating important biological hazards that should be considered at various steps in the production of sushi containing seafood4–12. This figure shows that specific scientific knowledge of the ecology of foodborne pathogens is essential. Figure 1. Important biological hazards for consideration in the production of sushi containing seafood. Once all the hazards have been identified, the next question that must be considered under Principle 1 is whether the hazard is significant for safety of the food. To determine whether a hazard is significant an assessment should be made of the level of probability of the occurrence and the level of severity if the hazard is present1,2. How will the HACCP team determine the significance of the hazard or quantify it? Again, knowledge of the ecology of foodborne pathogens is essential to answer these questions and if the answers are not known, the HACCP team must know how to source or research the information. The third problem is therefore related to a lack of knowledge about the level of severity or probability of the hazard occurring, in which case the significance of the hazard may be wrongly evaluated. Examples of questions for consideration by the HACCP team to identify evaluate and control a potential microbiological hazard are: does the pathogen produce spores or a toxin; can the pathogen, its spores or a toxin enter via an ingredient or contaminate the food during storage, handling, processing, packaging or distribution; what are the characteristics of the food or an ingredient (such as pH, water activity, nutrient content) that could allow the pathogen or its toxin to grow or be produced in this food or an ingredient; what effects will temperature, production environment, equipment and treatment of the food during processing and packaging have on the survival or growth of the pathogen or toxin; is there a past history of the pathogen causing foodborne disease in this food and if so what is the frequency; is there an estimate of the minimum infectious dose; would the effects of the hazard be moderate, serious, severe or critical for the general population or for vulnerable people if exposed to it; and is there an established Food Safety Objective (FSO) for this pathogen in this food1,2,13,14? These questions indicate the importance of the HACCP team’s knowledge of how to access resources such as scientific literature, information from specific food industries, government and international organizations and experts in the field, to determine if a pathogen is a significant hazard and therefore needs a critical control point for safety . There are many examples of weakness in the hazard analysis of a HACCP plan resulting in foodborne disease outbreaks. One example, as described by Dillon15, was highlighted when a brand of infant formula was recalled due to suspected Salmonella cases. Contamination levels were previously found below the accepted adult infectious dose and the possibility of susceptibility of infants had not been adequately considered in the product formulation or the initial HACCP study. Another example was snack salami with finger thick dimensions (1 cm diameter). In this case the method of production continued as for normal salami (7–8 cm diameter) but the surface area to mass ratio was critically different. The snack salami therefore dried much faster resulting in the growth of the fermenting bacteria being suppressed sooner and production of acidity being incomplete. This allowed Salmonella to survive and cause food poisoning15. In a national survey of over 1000 food businesses undertaken by the Food Safety Authority of Ireland, 40% of food industry personnel stated that the major barrier to implementing HACCP plans was lack of knowledge, but only 20% thought that understanding food microbiology and the ecology of microorganisms in food was important16. This highlights a lack of understanding of the importance of education in this area for food safety. This article has described challenges when identifying and evaluating microbiological hazards that may affect the quality of the HACCP plan. Many national and international companies have already successfully invested resources in this area and, as a result, these companies have ensured identification of existing hazards necessary for control. It is acknowledged that this may be harder for smaller food companies or those in countries with access to fewer resources. However, the knowledge gained by investing in quality education in microbial ecology of food will ultimately benefit food businesses, consumers and the industry, as it will be an added insurance of safe food. Adams, M.R. and Moss, M.O. (2008) Food Microbiology, 3rd edn, pp. 182–307, RSC Publishing. International Commission on Microbiological Specification for Foods (1996). Microorganisms in Food 5. Microbiological Specifications of Food pathogens. Blackie Academic and Professional. Forsythe, S.J. (2010) The Microbiology of Safe Food, 2nd edn, pp. 720–805, Wiley-Blackwell. International Commission on Microbiological Specification for Foods (2002). Microorganisms in Food 7. Microbiological Testing in Food Safety Management. pp. 1–70, 145–171, Kluwer Academic/Plenum Publishers. Dillon, M. and Griffith, C. (eds) (2000) Auditing in the Food Industry. pp. 64–69, CRC Press. Prue Bramwell is a Senior Lecturer in the School of Applied Science at RMIT University. She has over 20 years’ experience in food microbiology and has been an educator in the fields of food microbiology and HACCP for over 15 years. Her research interests are in methods for the isolation and identification of foodborne microbes.